Write and upload a review of one of the books that you have read for the Challenge and you are in with a chance to win one of six books published by Barrington Stoke. You need to send the Challenge people a quick email saying that you wish to be entered with your (hopefully) stunning review once you have uploaded it. If you haven’t signed up for the Six Book Challenge or just need a reminder about what it is all about, feel free to ask us more about it in the comment section, by email or in person. Vote for your favourite book on their shortlist for best book 2014 and you will be in their draw. There are three prizes: the winner will get £100 in National Book Tokens and two runners-up will receive £50 in book tokens each. 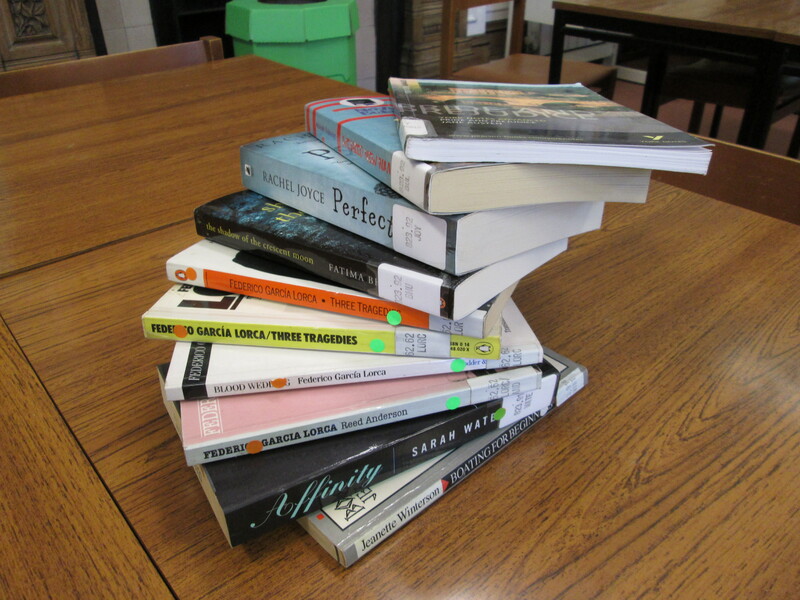 We just catalogued the non-fiction book winner (on the shortlist) in the LRC: Love, Nina. We are also planning to get a few more once they are published in paperback form. This organisation has lots of competitions running regularly. One that has just been released has you playing a game where you have to guess the title of the book by the visual clue. It is tricky and fun! If we get together and guess them all then we can win a year’s worth of National Book Tokens for the College. Email us or DM us on Twitter @hillcroftlrc with any you can think of! On Thursday 20 November our Learning Resources Centre Manager attended the 10th anniversary event for the Association of Pall Mall Libraries (APML). APML is a group of librarians originally working in the London private club sectors which also has librarian members from specialist libraries neighbouring the Pall Mall area. The tenth anniversary was celebrated with members of the association and their guest speaker James Campbell author of The Library: a World History published by Thames and Hudson. James’s talk included slides based on pictures from the book which charts the architectural history of libraries from Roman and medieval times to the present day throughout the world. Will Pryce took digital photographs of the libraries which are used in the book. Campbell explained how libraries were once made up of lecturns holding books or chained libraries until the advent of the standing bookcase. Libraries included Roccoco styled gems from Europe and monastic libraries in South Korea; and a modern day one built to encourage children to read by creating a stepped shelf environment inside. Find out more about the talk on the APML blog. If you’re into present day library architecture whet your taste buds with the E-Architect’s listing of the latest and greatest from around the world on their Library Buildings – Library Architecture page. Finding images for projects and assignments that are not under strict copyright restrictions needn’t be a headache. The ‘Unsplash‘ website has many Creative Commons Zero high-resolution photographs for anyone to download and reuse (even for commercial purposes). This means that as long as you cite the photograph then you can place it in your work. The creators have waived their rights to their photographs. Unsplash’s online collection includes photographs of buildings, food, computers, forests and other natural places. It is not possible to search for images, but they are aimed at being able to illustrate lots of different topics or just add a touch of attractiveness. They add 10 new photographs every 10 days. It is nice not to be overwhelmed with images as with other image databases. I came across the Unsplash site through Phil Bradley’s library blog which highlights loads of websites, great internet tools and apps that you might also be interested in. Year of publication (in round brackets). Title of photograph (in italics). For example: Domenico, M. (2014) Untitled. Available at: https://unsplash.com/miadomenico (Accessed: 21 November 2014). Hello all, I am Philippa and I joined the LRC team two weeks ago. I have just finished my Masters in Information and Library Studies so it’s wonderful to be able to see how everything I’ve learnt has real life applications. I have been busy learning the ropes and meeting everyone. Available through the MyAthens sign on page. This is great for accessing books 24/7 and you can’t lose them or spill coffee on them! We are keen to add more ebooks and get them used more by everyone. They can be a bit difficult to handle to start with, but it is possible to read online or you can download and/or print out useful segments (being respectful of copyright restrictions). TIP: I found out for downloaded ebooks in Adobe Reader you can customise the colour settings of the paper background and text. This is under the options toolbar: Edit –> Preferences –> Accessibility then checking the box ‘Replace document colors’. We held referencing induction sessions with the access courses. Getting all the right bits of bibliographic information in the right order can be frustrating but correct referencing is essential for academic integrity. TIP: I write out the full reference when taking notes from a resource. The details don’t have to be in the right order straight away – although it helps. As long as you jot down the key fields like author, date and title then you can often revisit the resource by looking it up on the catalogue or on the internet later. The handbook produced by the University of Lincoln can help you when it comes to writing out the references in full. The handbook can be found on the VLE (under the blocks Library and Learning Resources –> LRC Referencing and Plagiarism –> Text Assistance). 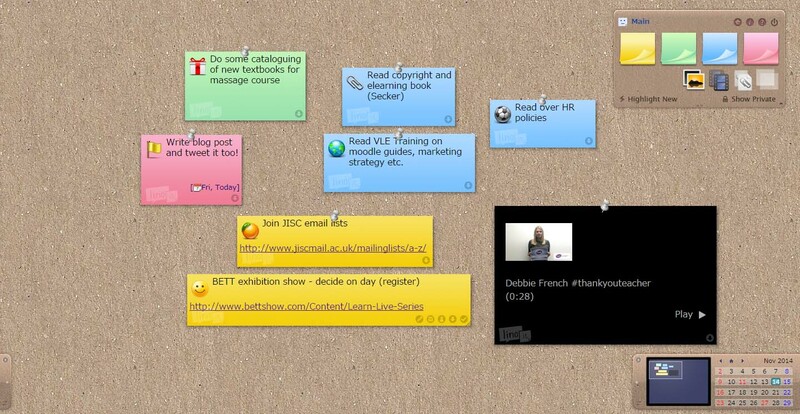 I was introduced to this virtual pinboard for memos and tasks (or anything you want!). I found it simple to post ‘stickies’ and to peel them off once they are done (in the right hand corner of the sticky). TIP: I like changing the colour of the sticky memo and giving it a cute icon to make task management more appealing. You can read more about task management in Stella Cottrell’s book ‘Skills for Success’. If you have any tips or good experiences using these resources please comment below or come and talk to me during the week. I would be delighted to hear from you either way! This week we have been looking at the Load2Learn website which Jisc TechDis have been promoting. 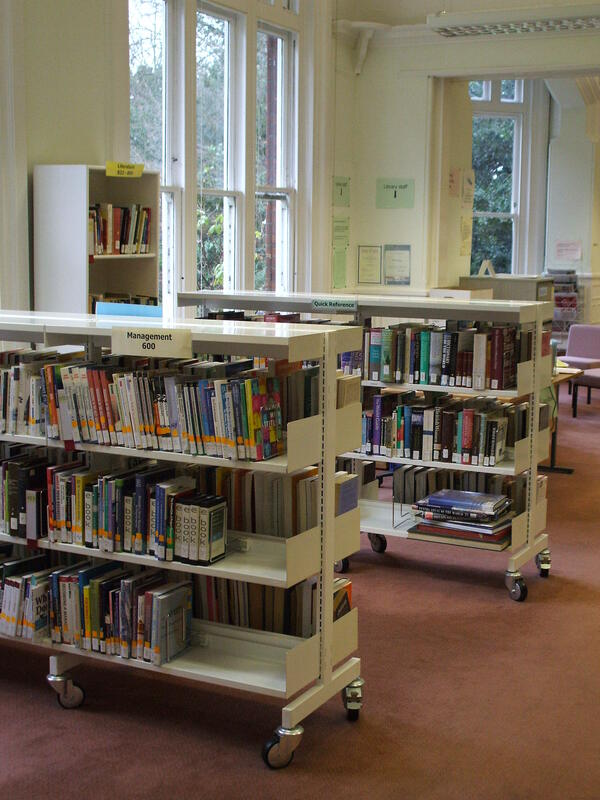 The site allows UK schools and colleges to give their students with print disabilities – and staff working with them – access to an electronic version of a publication that the library/Learning Resources Centre (LRC) holds in paper. Some of these electronic formats include PDF, MP3, ePub and Daisy. These formats are also dyslexic-friendly as they give them the chance to add notes, highlight, change background colours, increase font size and get them to read out loud. And it’s free! It’s good to have a centralised system and repository for storing and accessing material without have to contact each individual publisher. All you have to do is sign up on their website and get approved as a member for allowing access to download and upload material.